There are two paths in life: Should and Must. We arrive at this crossroads over and over again. And every day, we get to choose...what we Should do or what we Must do. What are you choosing today? If you’re looking for more ways to put your Must into action, The Creative Collective is just the thing for you! What is it? 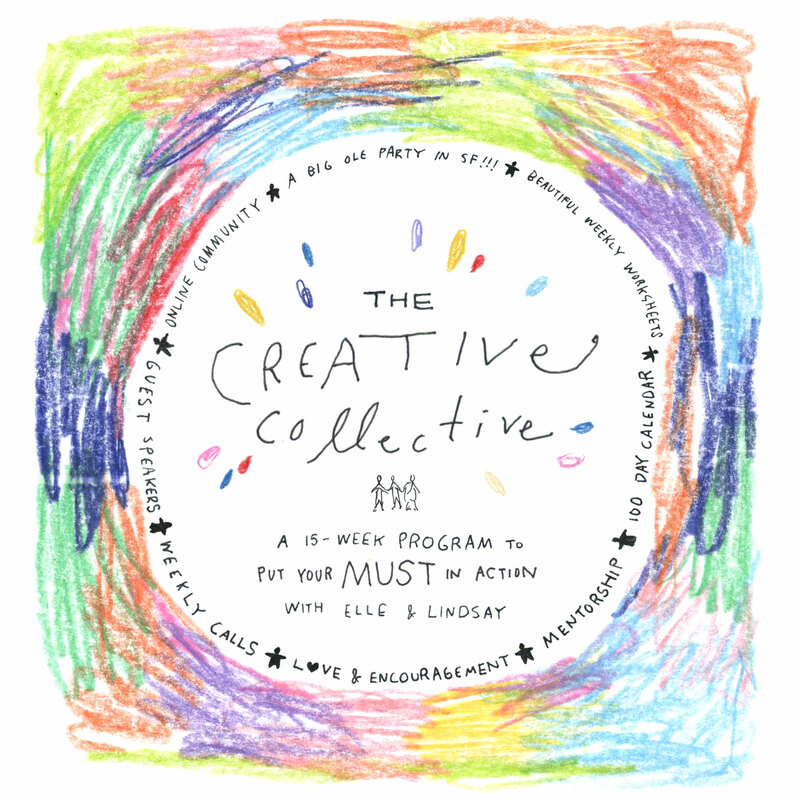 The Creative Collective is a 15 week program led by Elle Luna and Lindsay Jean Thomson to support makers participating in #The100DayProject. It’s for people looking for more community, accountability, and inspiration over 100 days of making and sharing their creative projects online. And a big ol’ party in San Francisco at the end to celebrate! The Creative Collective is just $30 a week for all of that good stuff. It starts Monday, April 3rd and the last day to sign up is Friday, April 14th – join us! Be part of the community of people choosing Must! When you commit to your creativity, you become who you're meant to be and do what you're meant to do! Q: Do I have to do The Creative Collective to do #The100DayProject? A: Nope, definitely not. The Creative Collective runs simultaneously with #The100DayProject and is a program to support people participating with additional content and mentorship. #The100DayProject is a free, global art project that anyone can participate in. More details here – sign up for the newsletter to get weekly prompts and encouragement. Use the hashtag #The100DayProject to share your work on Instagram and find other makers. Q: Do I have to be an artist to do The Creative Collective? A: Trick question! We can all be artists. Yeah, really! You don’t have to consider yourself an artist or even particularly creative to participate (we’ll work on that! 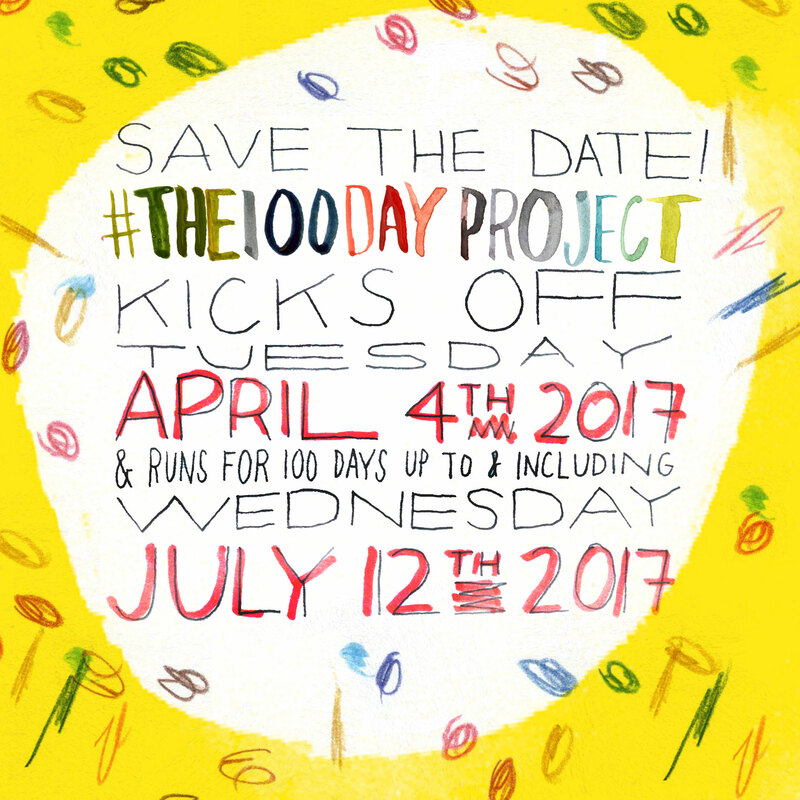 ), you just have to commit to doing #The100DayProject and have a desire to get in touch with your creative side. Everyone is welcome to participate regardless of gender, race, sexual identity, religion, location, anything. You are welcome here. Q: How much does The Creative Collective cost? A: It’s $450. We’re setting aside 20-$150 scholarships for people on a reduced income – students, teachers, artists. That’s on the honor system and it’s first-come, first-served. Use the code scholarship at checkout (first create an account then click "Have a coupon?" before submitting your payment details). A: It felt right – not too much, not too little. It's about the price of a cup of coffee a day. And it’s enough money that you won’t want to just throw it away. We want you to actually show up and do the work so that you can get the most out of it. A: The Creative Collective kicks off April 3rd, one day before #The100DayProject starts on April 4th. Q: When are the weekly calls? Do I have to participate every week? A: The weekly calls are every Monday from 8-9AM PST, April 3rd through July 10th. We recommend participating live as often as you can to get the most out of it. But if you can’t join, no big deal – we’ll be recording all of the calls and sharing them with The Creative Collective after. Q: What’s the format of the calls? A: Good question! Most weeks, the first third we’ll spend talking about the previous week’s reflections, the second third introducing new material, and the last third for Q&A or discussion. Q: What are the weekly worksheets? Will they take a lot of time? A: The weekly worksheets include 3-4 prompts for reflection and 1 action to take each week. They’re not meant to take long – you can go as deep as you’d like (or have time for). Q: Where will I connect with other participants in The Creative Collective? A: Facebook! We’ll have a private community page to talk about what you learn from the prompts each week, share your process, and give and receive encouragement. 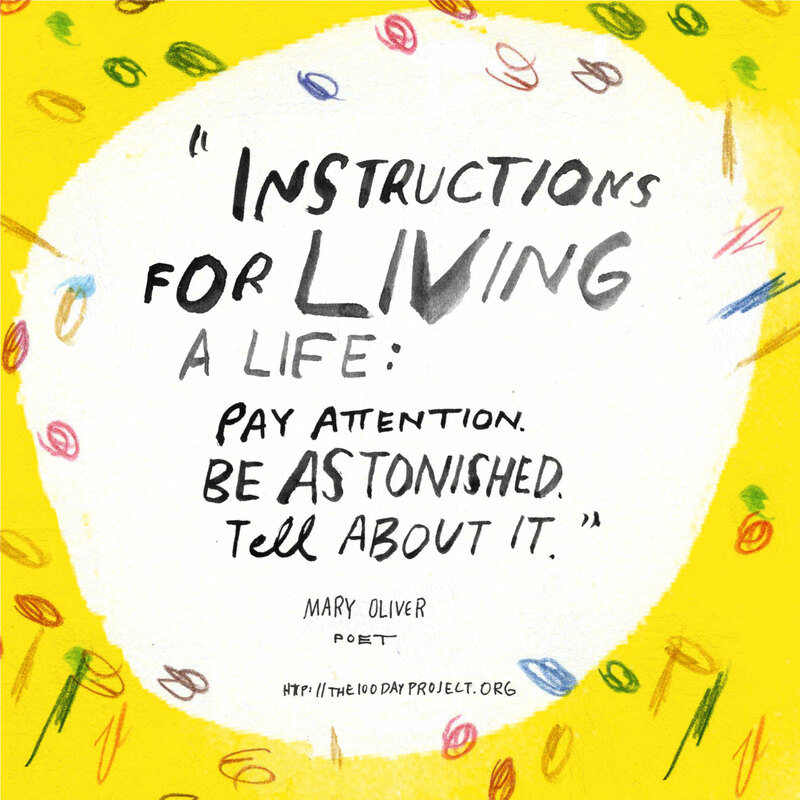 Q: What will I learn in The Creative Collective? Who gets to call themselves an artist? How can I give myself permission to be an artist? What do I do about that voice in my head that says not good enough? What do I do when I run out of ideas and I really, really want to quit and ohgod why did I sign up for this?! Q: Who else will be doing The Creative Collective? A: All kinds of people! Some of them are working artists, some are just starting out, some are in between. Everyone is welcome, regardless of where they are in their creative journey. A: Mentorship from Elle and Lindsay, including our favorite tools for reflection and personal growth. A rad community of creators supporting you and your process. Learning from guest teachers like Windy Chien, Laura Brunow Miner, and more. And for those of you in the Bay Area (or willing to travel! ), a big celebration at the end. Plus, all of the things that you get from doing #The100DayProject: the joy of creating, the sense of accomplishment that comes with self-discipline and working through resistance, honing your creative skills, and so much more. Check out the Q&A call Elle and Lindsay did here. Q: What kind of project can I do? A: The only limit is your imagination! You could do 100 Days of Lettering. Or disco wallpapers, or...what are you curious about? What lights you up? We’re going to be leading a free Q&A video call for the entire #The100DayProject community on how to pick a project soon – stay tuned and join us! Other questions? Email us here and we’ll get back to you soon. Elle Luna paints, designs, and writes. She also runs a textile venture, the Bulan Project, a collaboration between designers and master batik artists in Bali, and has previously worked as a designer at IDEO and with teams on apps and websites, including Medium, Mailbox’s iPhone app, and Uber. Ms. Luna speaks to groups around the world sharing the story of “The Crossroads of Should and Must,” and lives in San Francisco and online at instagram.com/elleluna. Lindsay Jean Thomson is a champion for finding the best in yourself and others. She is the co-founder of Women Catalysts, a membership organization dedicated to inspiring more women to action. Women Catalysts has a thriving online community and hosts events in San Francisco, Los Angeles, and New York. In addition to leading Women Catalysts, Lindsay is a writer and has most recently been chronicling her story of being diagnosed with breast cancer. Lindsay's motto is anything is possible (a message she shares wherever she can)!